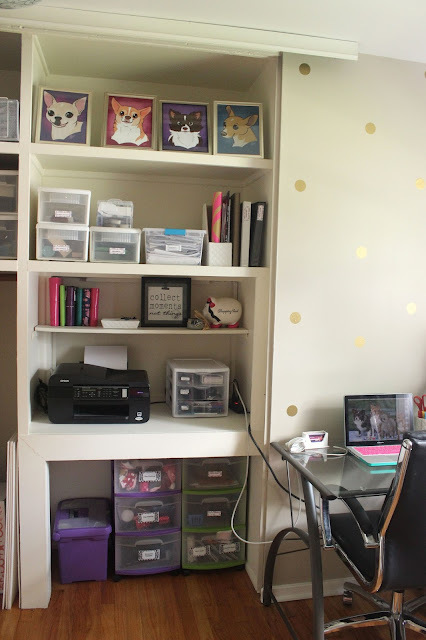 The difficult thing about the home office in our new house is that it doubles as a storage space AND the room where my pet rat is kept and where my dogs can use their pee pads. Because of that, I have to make sure I keep it organized AND stylish. So here is how I do that. I used to use a paper To Do List for blog stuff, until I realized that it often got lost in between other papers or in a pile of unwanted clutter. So now I make it big and hard to miss! This Dry Erase Frame Wall Decal from RoomMates is AMAZING!! The frame makes it super stylish so it looks great on the wall in the office but most of all, I love that I can write HUGE on it. And - I love that the marker sticks to the frame so I can easily hang it up when I'm done using it. The best part is, if I ever want to move this decal, I can just lift it off and put it elsewhere. Sometimes I even clear it off and write a fancy and beautiful little quote on it if I have guests over. 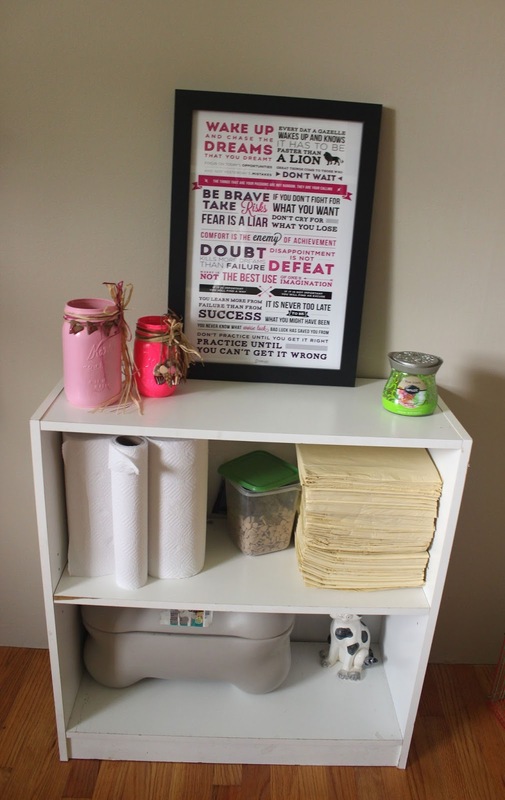 Sure it may not look super appealing to have dog toys, rat food, paper towels, and pee pads stored in the same little unit but guess what - I take away from that with some décor on top of the shelf. I don't even know what else to say except that I LOVE ORGANIZING! I put like items together and label them and then figured out a good way to arrange them so that this wall doesn't ONLY look like it's for storage. I mixed in some décor in whatever ways I could like the little frame, the Filofaxes, etc. So organized! I wish I could say the same about myself, haha.